Almost three days in Tbilisi this week, two long ones spent training Georgian journalists, left precious little time to see a city I was visiting for the first time. So I asked my new friend Akaki to show me as much as possible the morning of my departure, which I did on a walking tour of key attractions. 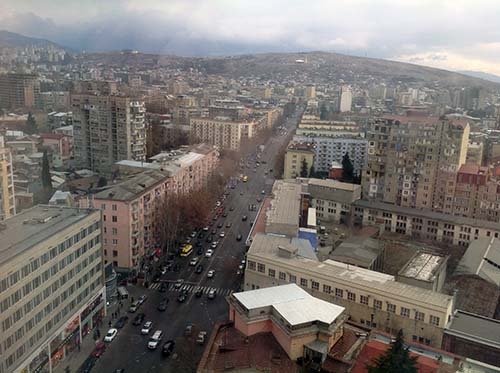 It's a city of contrasts, with apartments and offices in "Soviet Blocks," a local takeoff on the Soviet era's drab buildings that I'd seen in Moscow, Prague, Budapest and Belgrade. (Georgia was for decades under the Soviet umbrella and in a previous era Imperial Russia held sway over the country's affairs. It enjoyed a few years of independence in the early 20th Century, went through a brief civil war in 1991-92, and since 2003 has known relative stability). 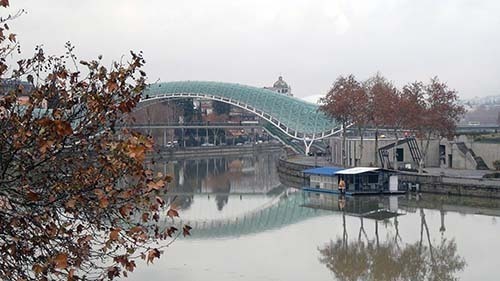 But it also features Caucasus-style architecture and modern creations in steel, glass and whatever struck designers' fancy, like the Tbilisi Concert Hall. A bus ride from my hotel to the older part of town for a mere 28 U.S. Cents meant I could take in some major sites. Sadly, my brief stay prevented me from actually going inside the ones I really wanted to see, like the museums. 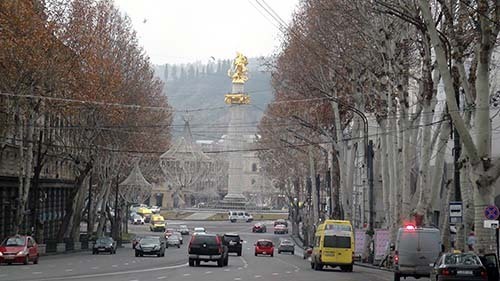 But a walk down Rustaveli Avenue, so named after a 12th Century Georgian poet, on a cold January morning allowed me to appreciate some of the country's history, which my guide recounted with relish. The Moors, usually associated with Morocco and Andalusia in Spain, influenced Georgians whose capital city Opera House and Theater was built in their architectural tradition. I wish I could have attended a performance there or seen those acrobatic, toe-hopping Georgian dancers in their colorful traditional costumes. An impressive gold statue of St. George slaying the dragon and perched atop a column in Freedom Square on the grand avenue caught my eye. The majority of Georgians, I was told, are Orthodox Christians. 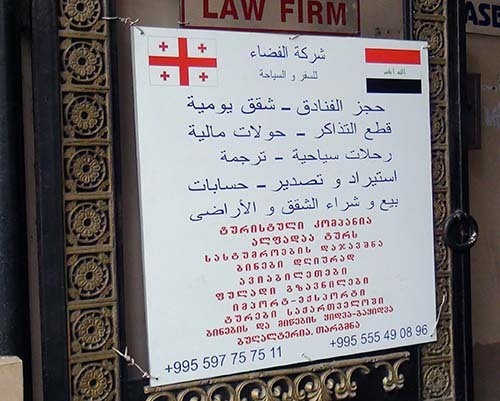 Twice on my short promenade I came across signs for what seemed to be Iraqi businesses. 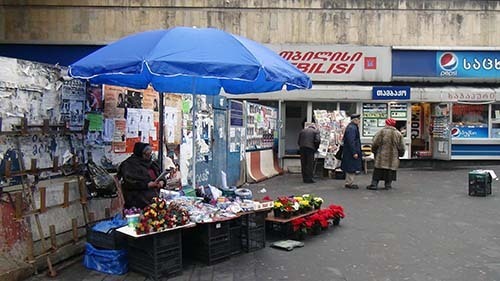 One publicized "halal" Arabic and Iraqi food, in keeping with Islamic law, and the other held with wires onto a metal gate advertised services of a travel and tourist agency that also dabbled in hotel and apartment reservations, money transfers, translations, exports/imports, accounting and real estate. Other vendors on that street offered local fast foods and snacks but what stood out the most were McDonald's golden arches. From a distance I could see a statue of Kartlis Deda (Mother Georgia) guarding over the city, a welcoming cup of wine for friends in one hand and a sword to ward off enemies in the other. As we strolled down into the older part of the city with cobblestone streets and trendy watering holes, I was taken aback by a purple sign on the side of a building that read: "Medusa Hookah Lounge and Club." Mercifully there was a no smoking section at the hotel's dining room, but the lounge stunk of tobacco-related products, as did most of the places I visited. 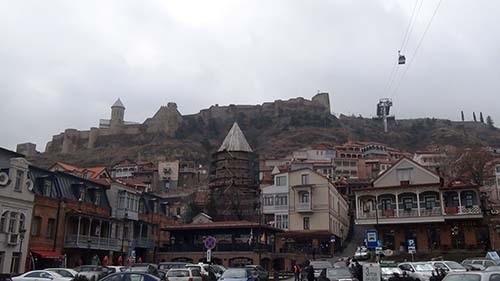 The hills above that gentrified neighborhood offer a panoramic view of expensive restaurants, houses and a cable car where visitors can ride up to the 4th Century Narikala (inaccessible) Fortress. 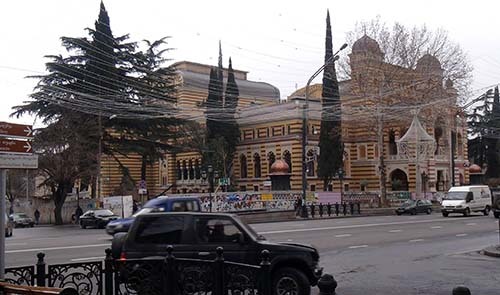 There was no shortage of Georgian Orthodox, Armenian Gregorian and Roman Catholic churches along the way. I tried entering two that shared a common courtyard but both were locked. I bought two cloisonné enamel crosses and a silver crucifix as gifts, along with a typical Georgian hat and other hand-made souvenirs. Requisite bottles of Georgian vodka called "Cha Cha" and cognac are warming reminders of the visit. The final attraction I caught before heading back to finish packing and going to the airport was the ultra-modern pedestrian bridge cutting across the Mtkvari River. The various vintages, assorted dishes, hot springs and sulphur baths will have to wait for another visit. "Tbili," I learned, means warm in Georgian.